When specifying underfloor heating in commercial projects it is important to use a specialist design-and-supply company with sufficient expertise in commercial applications, who can offer dedicated floor cassette solutions. 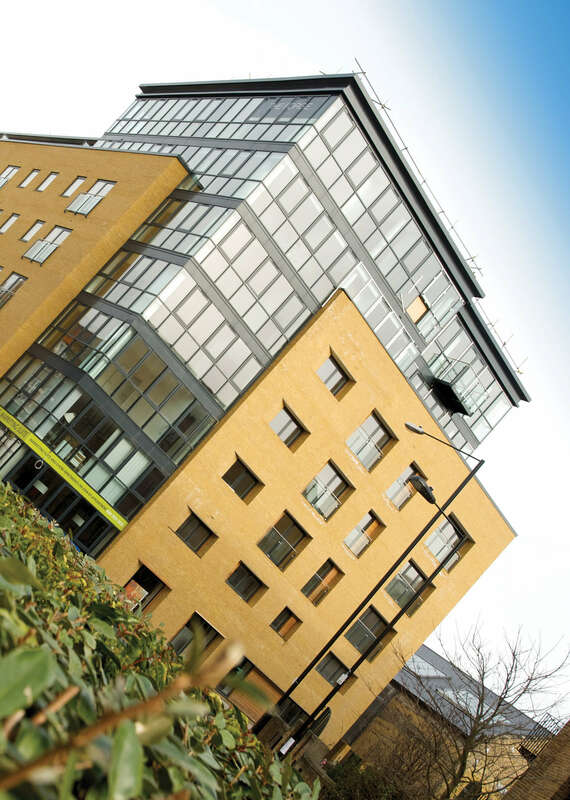 Warm water UFH is a common choice of heating for new domestic housing and apartment blocks because it frees up limited wall space allowing a larger area to be used for furniture and fittings but there are also very good reasons for using it in larger commercial projects. 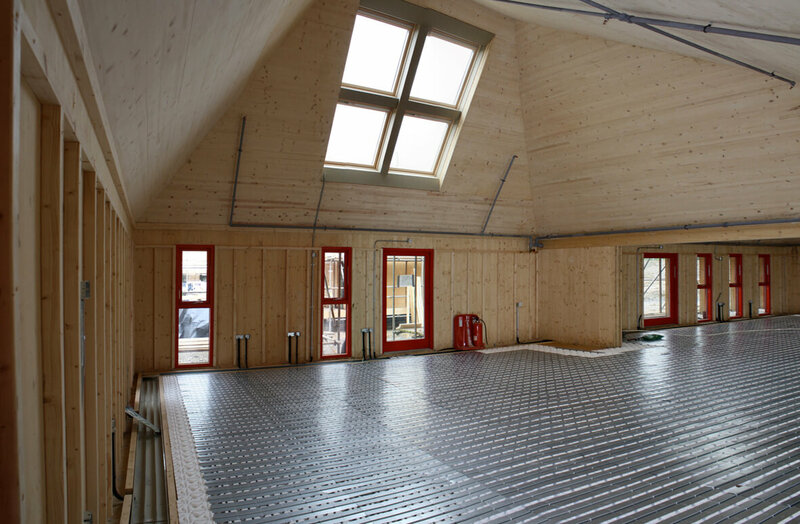 The heat profile of UFH allows radiant heat to rise from the floor without the convection currents created by traditional radiators; heat is concentrated in the lower part of the space rather than circulating to the top. This is the ideal heating profile for the large open areas found in warehouses, schools and public spaces such as reception areas, as the radiant heat will not be lost in the same way that high air changes would lose convected heat. The low flow temperatures of warm water UFH make it an ideal partner for heat pumps, allowing the heat pump to operate efficiently and giving a higher coefficient of performance (CoP). This is particularly important under the soon-to-be-updated Regulation 25A (within Building Regulation Part L2A), which covers ‘Consideration of high-efficiency alternative systems for new buildings’. It is now a requirement that a feasibility study into the use of energy efficient sources such as heat pumps (amongst other things) must be presented to the local authority before building starts. Low flow temperatures also mean that a standard gas or oil condensing boiler will operate in condensing mode more frequently, improving efficiency. UFH pipe is generally specified as 20mm in large, open, commercial applications although a hybrid system utilizing 14mm or 10mm may be more appropriate in some circumstances. Detailed design is crucial to the eventual success of any complex heating system. A good design/supply company will undertake a thorough assessment of each project, taking into account all relevant information in the design process before specifying the most appropriate floor construction. This should include: the building’s heat losses – especially important in warehouses with large openings in frequent use; the proposed heat source – gas/oil boiler, heat pump, biomass, etc; the final floor coverings, as this will affect the amount of heat output required, with stone/tiled surfaces being the best conductor and carpet with underlay being less efficient; and the building’s occupancy profile, i.e. is it in use 24 hours a day or are there long periods when it is left empty and does not require heating. A set of bespoke tube layout and manifold drawings should be provided with clearly illustrated floor cross-sections, manifold positions (which should be discussed in advance with the specifier/architect and end-user to ensure positioning is unobtrusive but accessible for servicing), coil lengths with their associated flow rates, and full-colour layout drawings that make it clear how many coils of tube are to be installed within each zone, their connection to the manifold and the sequence of installation. This level of detail ensures the UFH can perform in line with detailed design calculations and the supplier can guarantee the system design will meet the building heat load. Where a heat pump is chosen, it is crucial to use a supplier that understands the complexities of system integration. Companies that supply both technologies will be able to provide detailed mechanical and electrical schematic drawings to clearly illustrate how the technologies should be linked for both first and second fix installation stages. Where government financial support is being sought, the heat pump itself and the installer must have MCS approval and the system design forms part of the MCS documentation, so it is crucial that an experienced supplier is involved. Many commercial applications fall outside of the MCS criteria, for these applications it is again critical to work alongside a specialist supplier who can model what is certainly a bespoke system design and provide the design/modelling and commissioning data to quantify the efficiency of the design for submission as part of the application. A storage calorifier may also form part of the system, so using a supplier that can supply a package solution will simplify the specification process, ensure the as installed system meets the design brief and operates to the highest efficiencies. Detailed installation instructions should always be provided even to an experienced installation contractor. All underfloor heating systems have their individual characteristics and the ability to check specific details on site without the need for a phone call is always going to be more cost-effective and efficient. These should include bespoke mechanical and electrical layouts as well as instructions for filling, flushing and commissioning the system. Comprehensive installation and commissioning data should be supplied for incorporation into the O&M manuals for the property owner. This should include instructions for fine-tuning the system to meet individual requirements, programming heating controls, making seasonal adjustments, maintenance requirements and some basic troubleshooting. Product warranties vary across the industry but most underfloor heating tube is manufactured in the same way from similar materials, so the life expectancy is pretty universal, usually at least 50 years. Most product warranties only offer product replacement cover, however a small number offer a comprehensive 10-year product replacement and full re-instatement warranty (third party) on the underfloor heating tube. Other components such as manifolds and pumps, etc., will have differing warranties often linked to the original manufacturer, but all should be sufficient to offer the purchaser complete peace of mind. Companies with complete confidence in their design engineers and the robustness of their software carry full Professional Indemnity Insurance and product liability cover, sometimes backed up by free technical support both during and post-installation and supported by field engineers based across the UK. As required, experienced personnel should be available to visit site to discuss proposals and assist with tender documentation by providing technical specifications, mechanical schematics and dwg-format construction diagrams. They should also be happy to offer support with client presentations and to work with installation teams to ensure a smooth installation process. Post-installation, the supplier ought to be willing to support their customer with promotional and marketing activity where appropriate – after all, a successful development reflects well on all of the suppliers involved.